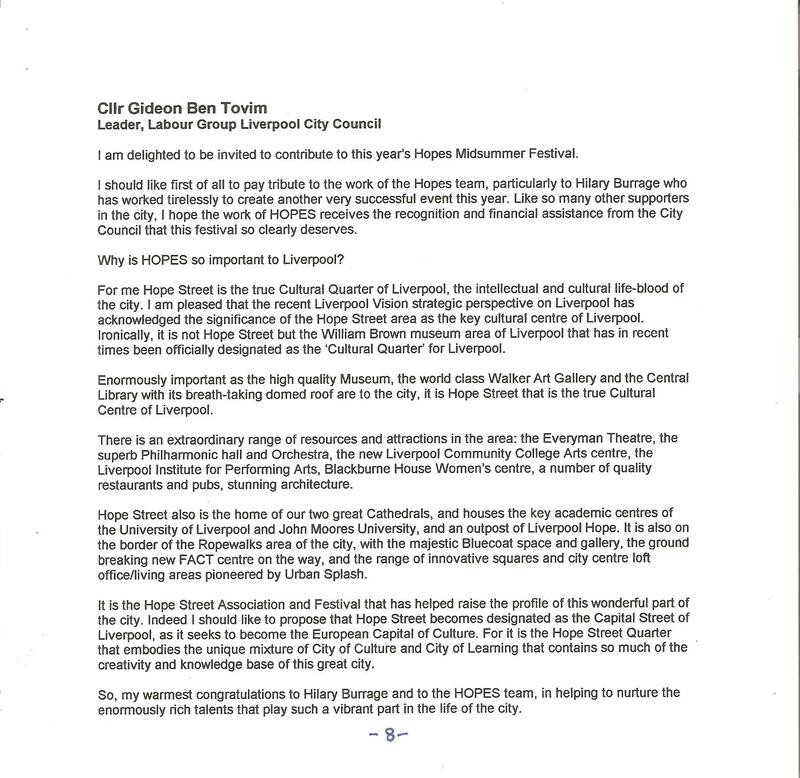 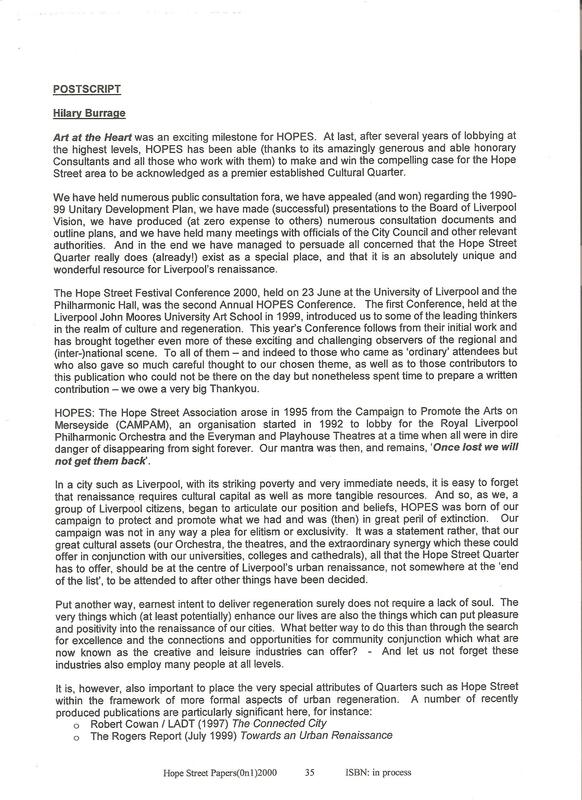 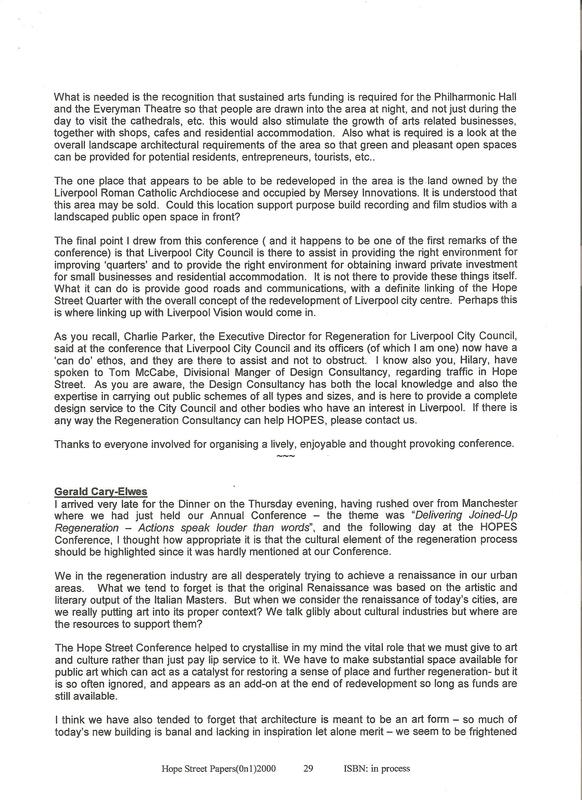 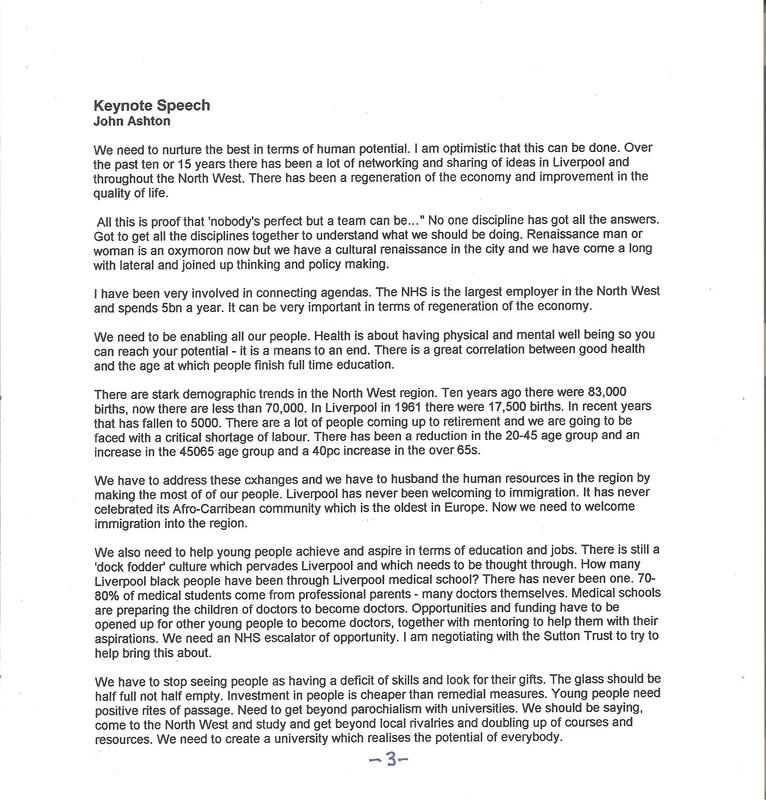 HOPES: The Hope Street Association, of which I was the founding and continuing (honorary) Chair, held a number of regional and national conferences and meetings in Liverpool during the run-up to the Millennium and the years immediately thereafter. 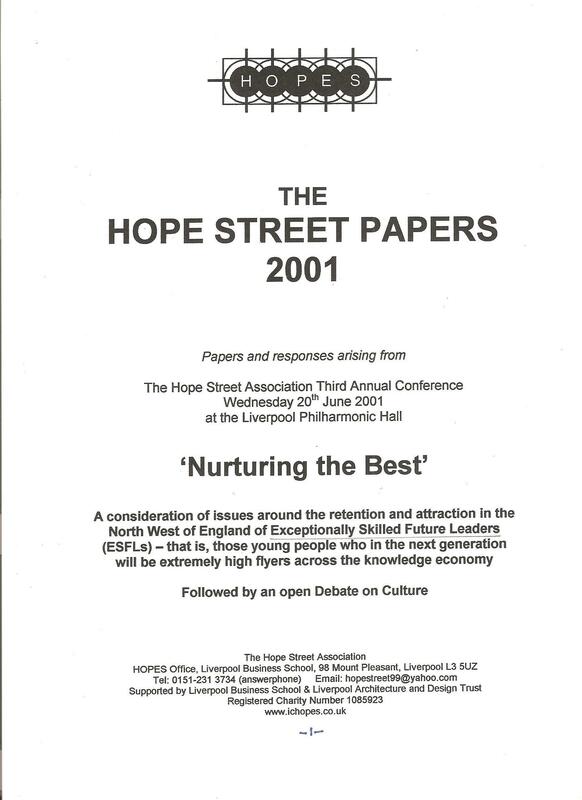 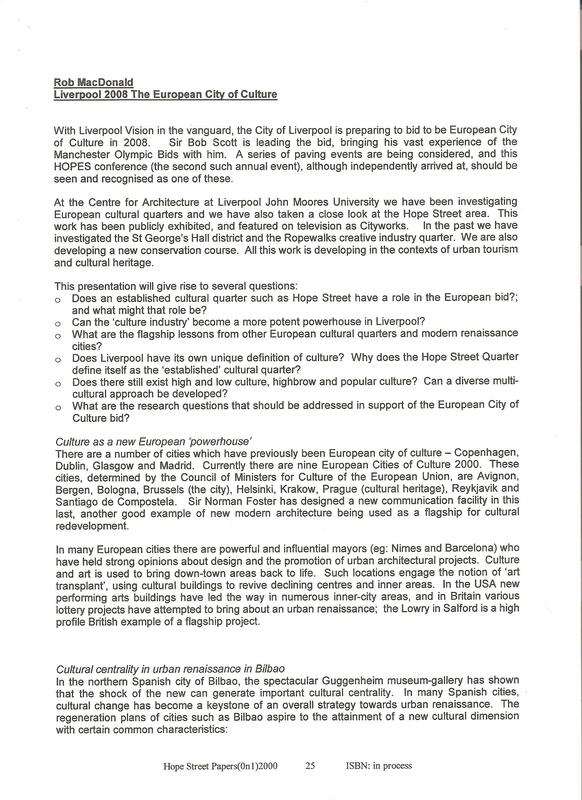 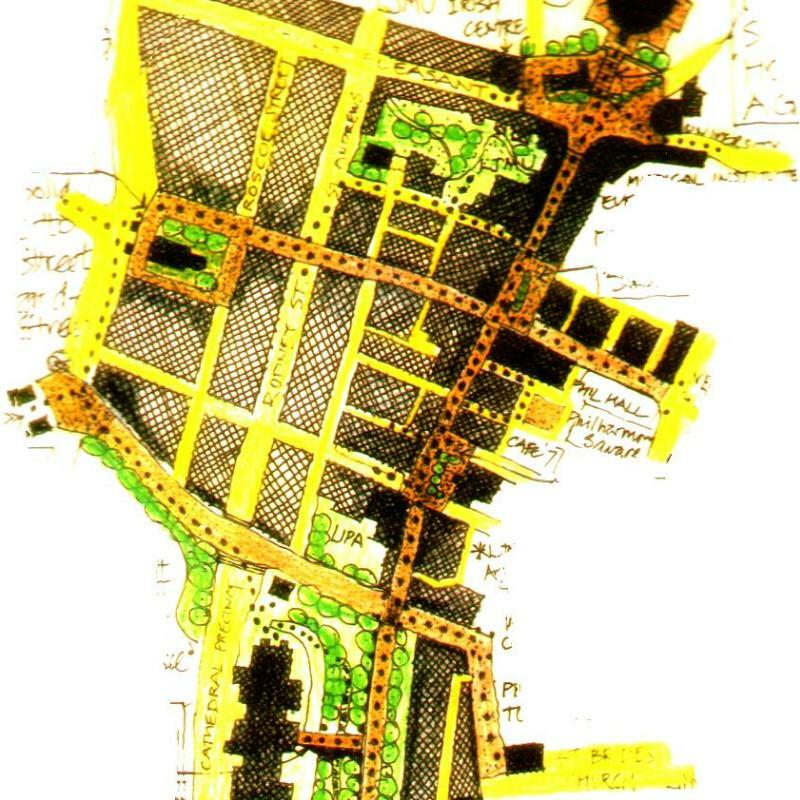 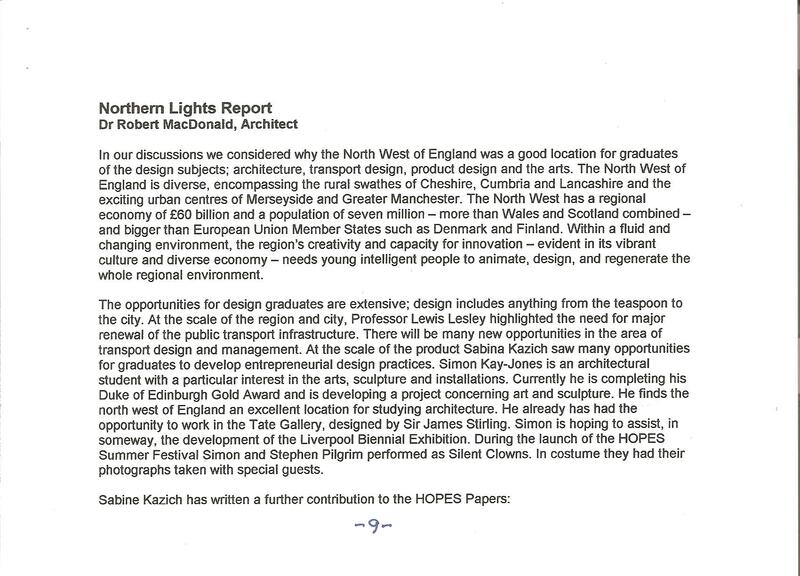 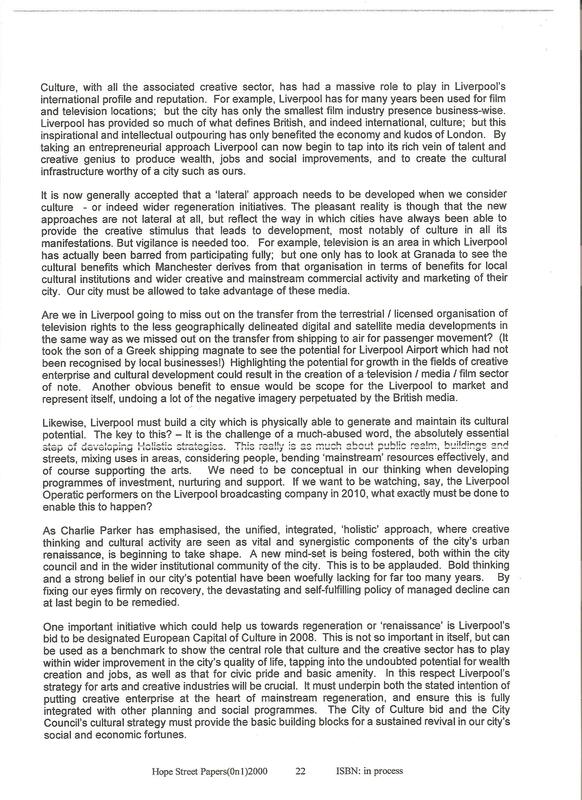 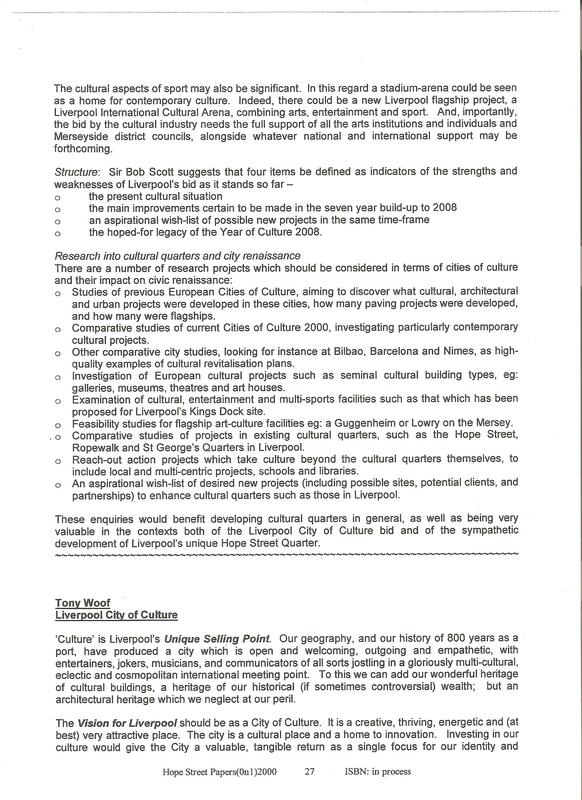 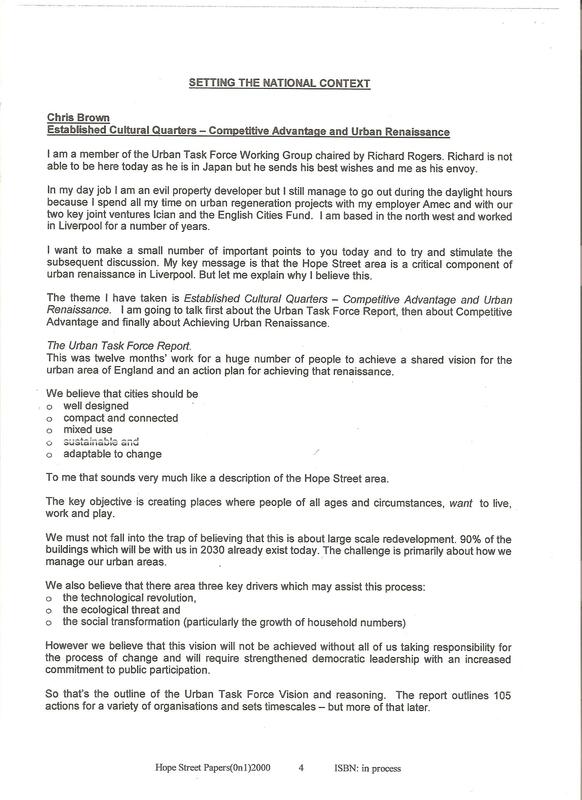 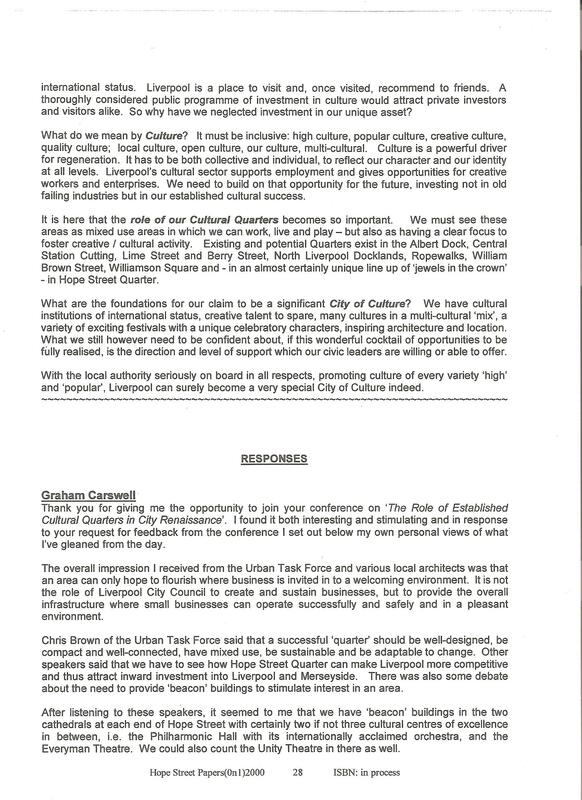 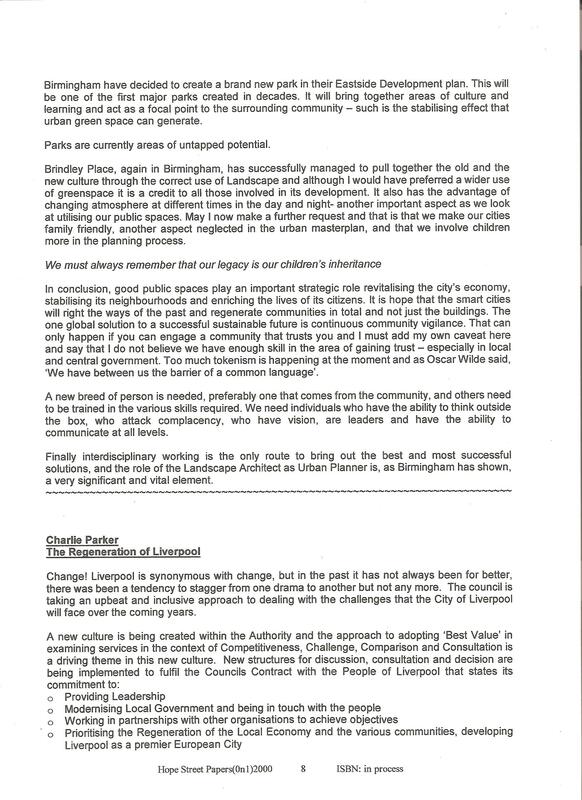 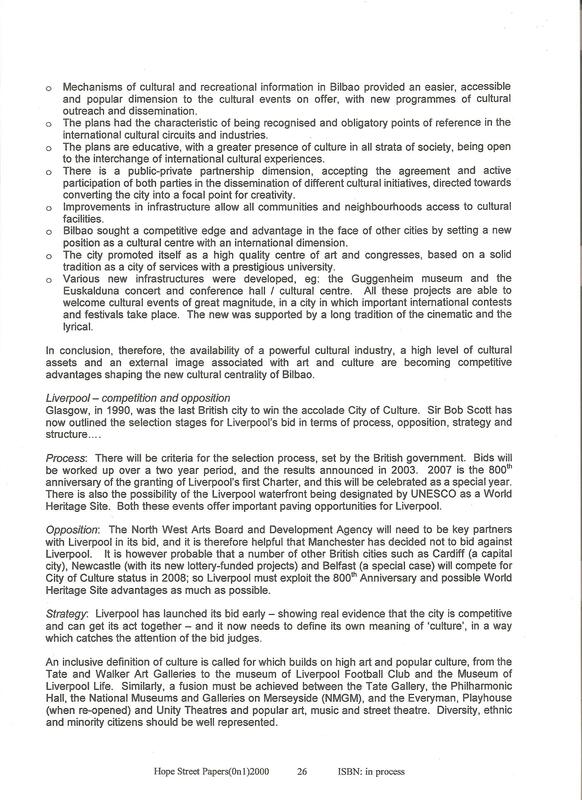 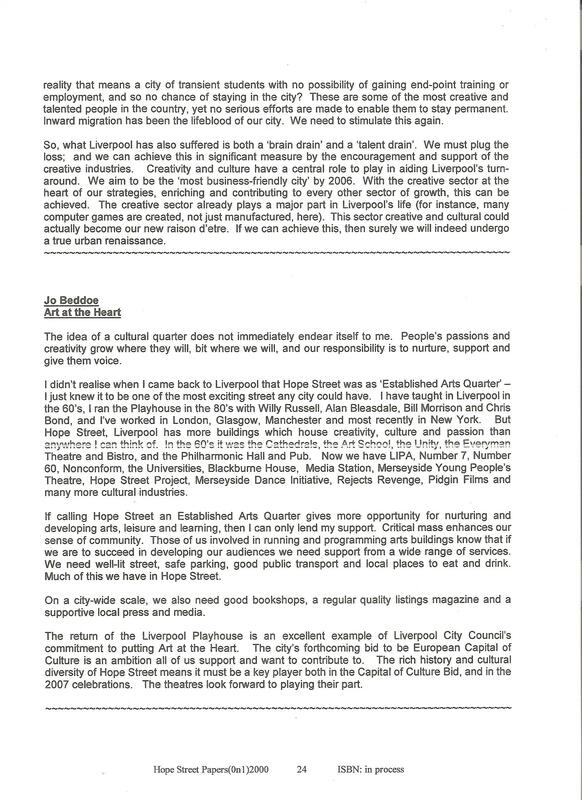 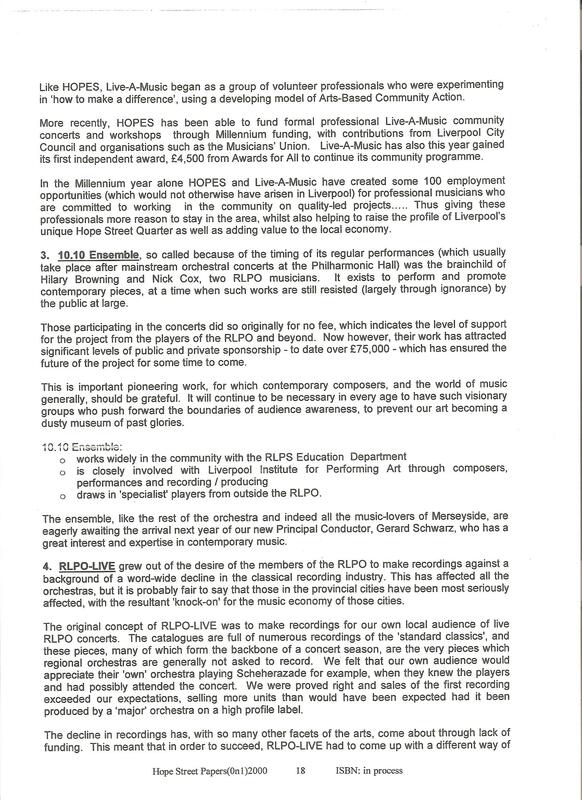 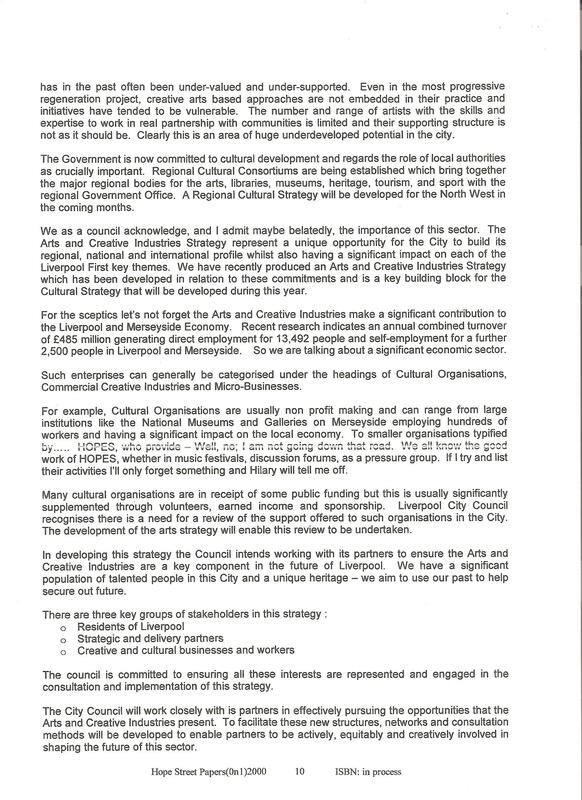 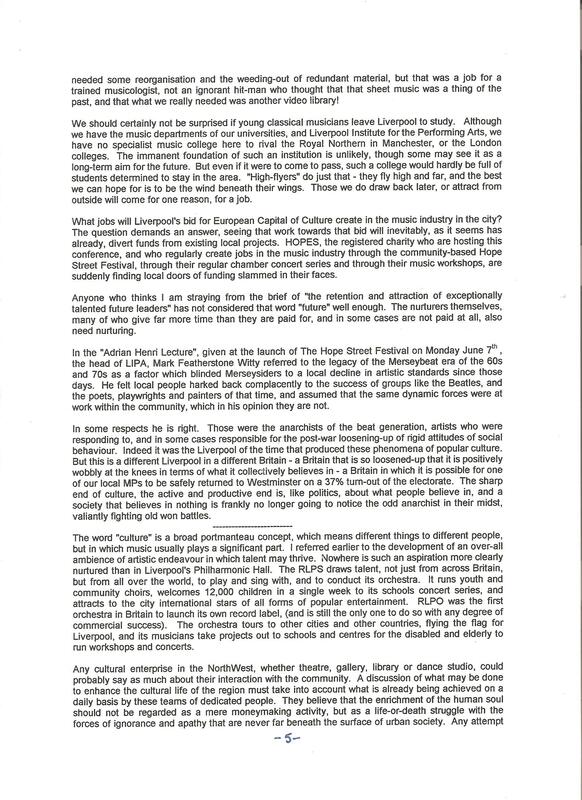 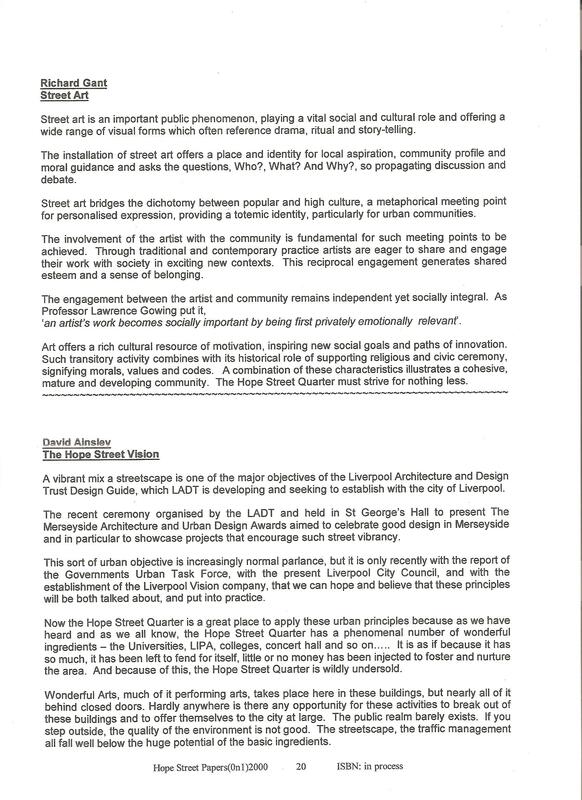 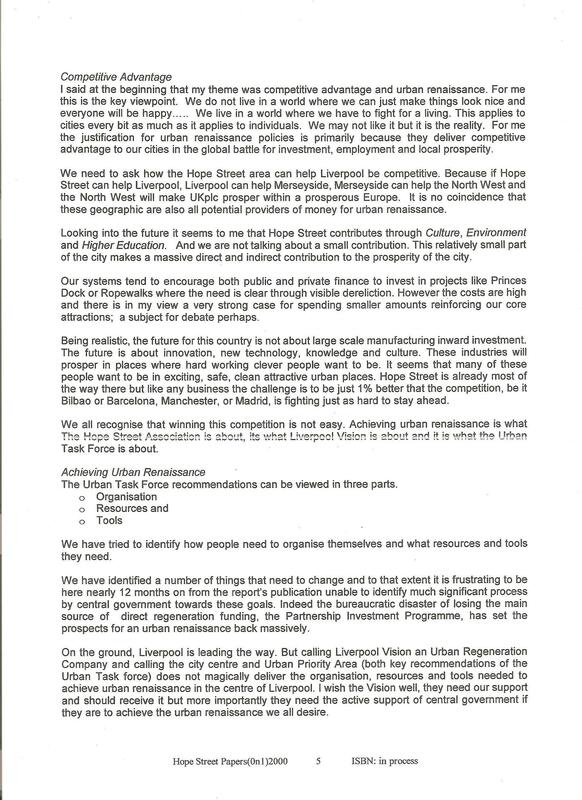 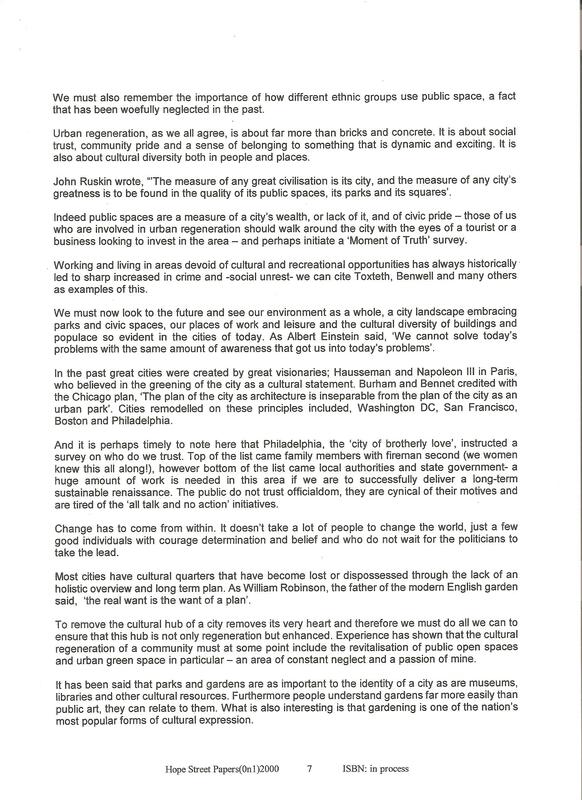 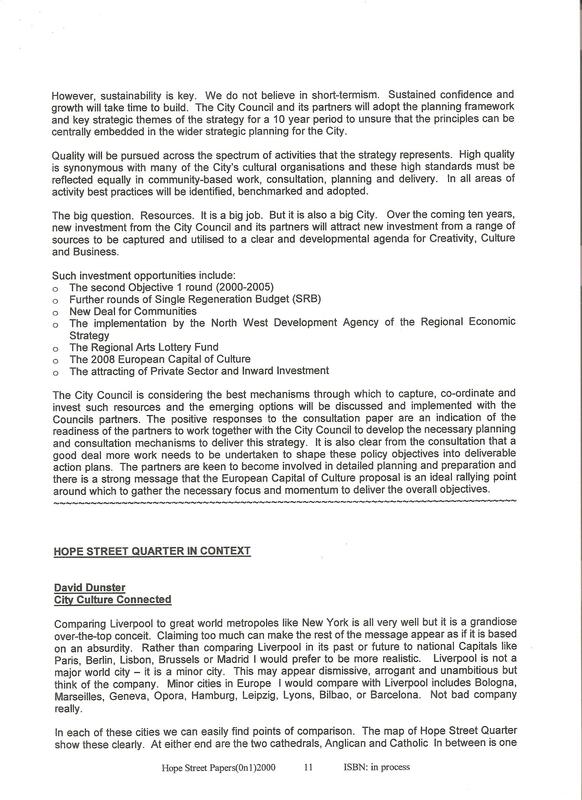 The purpose of these events was to examine and refine the concept of developing Hope Street as a Quarter – a cultural and knowledge hub which would be of enormous benefit overall to the Mersey region, the City of Liverpool and, very importantly, to the people who live and work in or nearby (e.g. 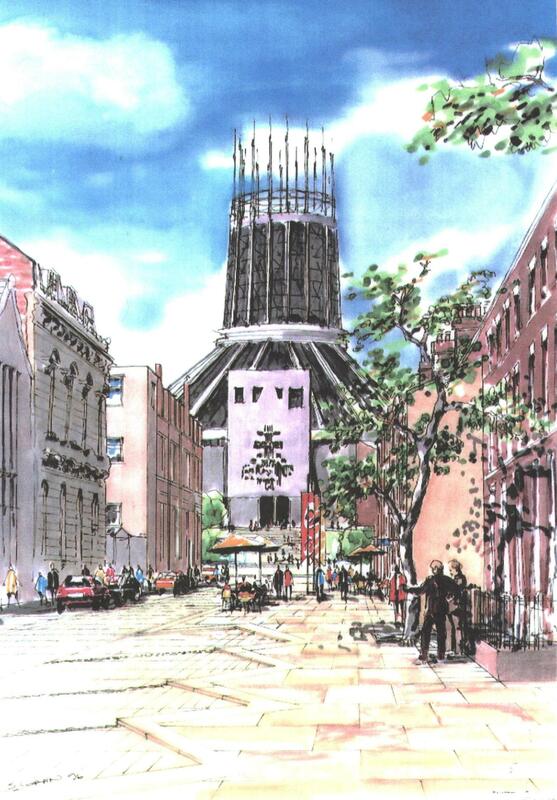 Toxteth) the Quarter itself. 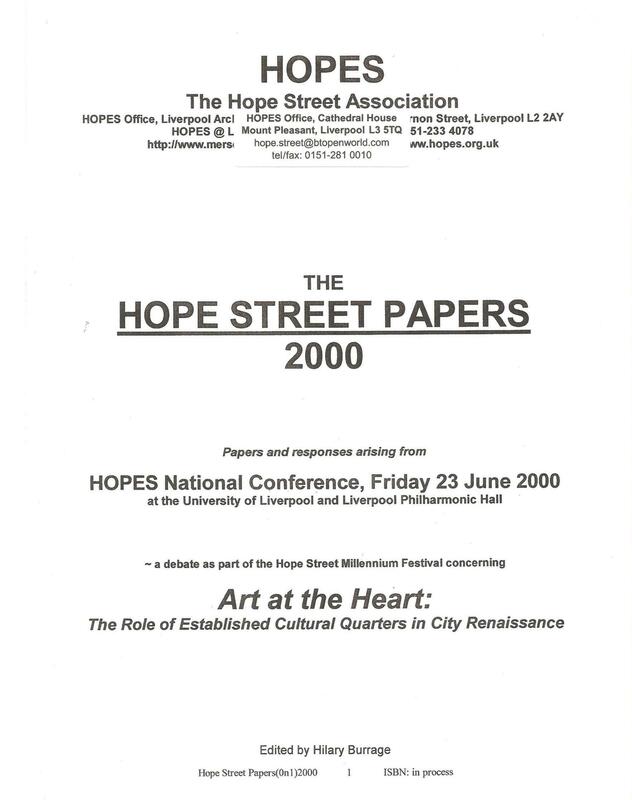 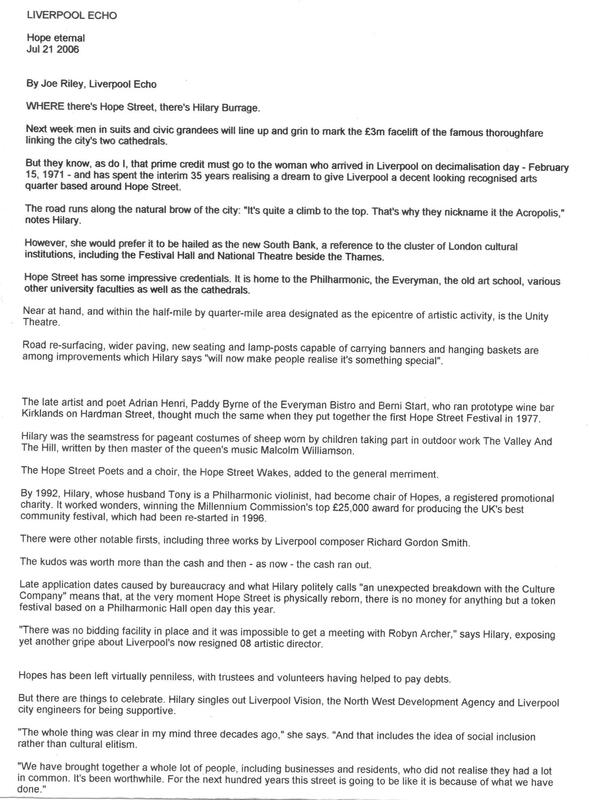 One of the major outcomes of these events organised by HOPES was the Hope Street Papers of 2000 and 2001. 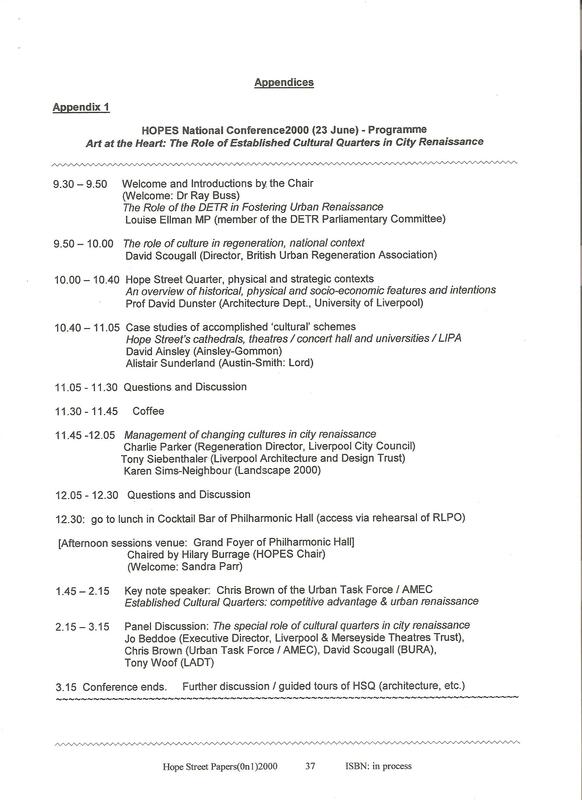 (The essence of the 1999 Conference is attached as an Appendix to the Year 2000 Papers.) 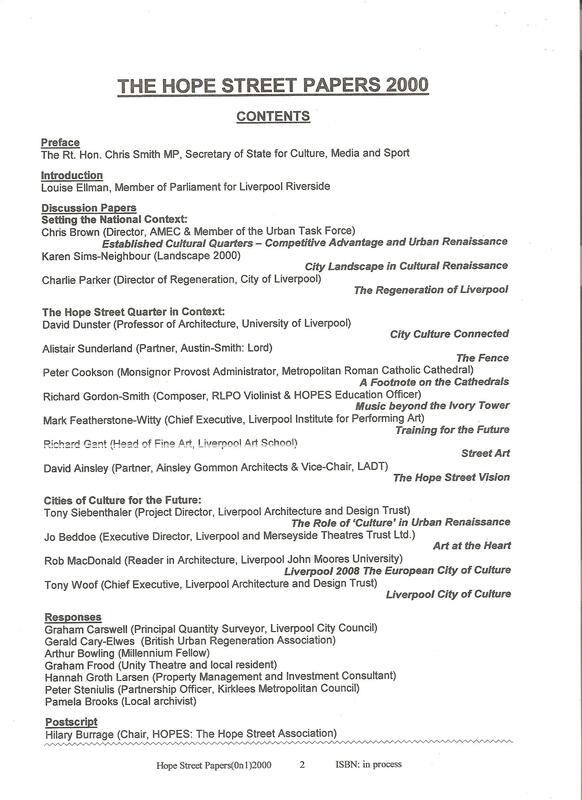 These papers were presented by a number of very significant players in the regeneration and cultural fields; our sincere thanks to them all. 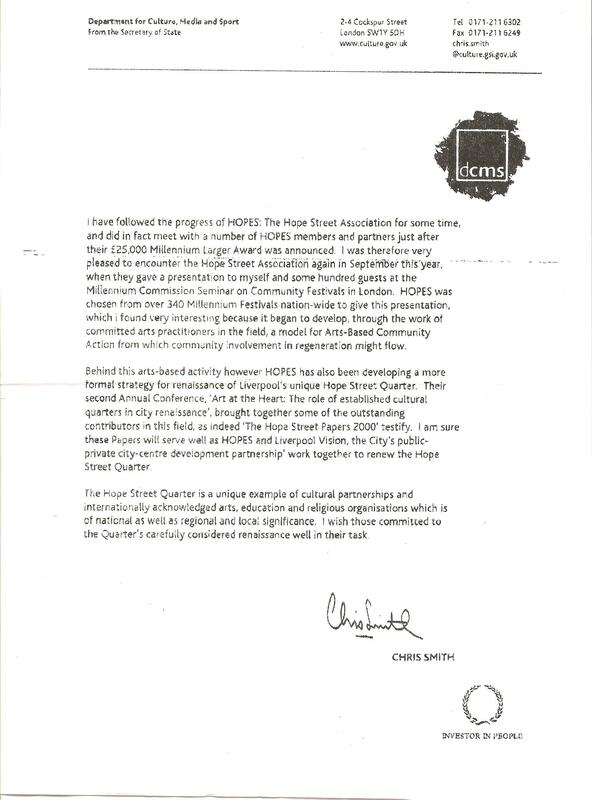 We were of course particularly delighted that Chris Smith (then an MP and Secretary of State for Culture; now in the Lords) wrote an introductory piece for the HSP2000 in which he acknowledged the work and progress we were making. 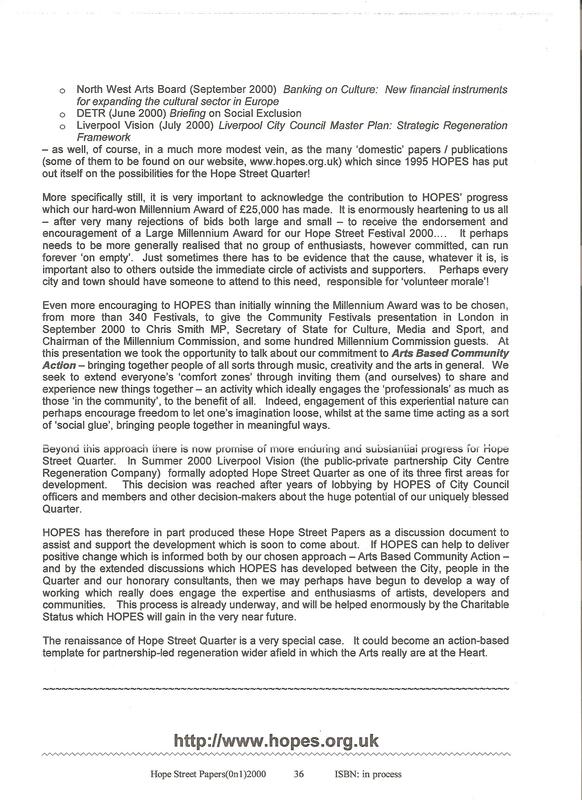 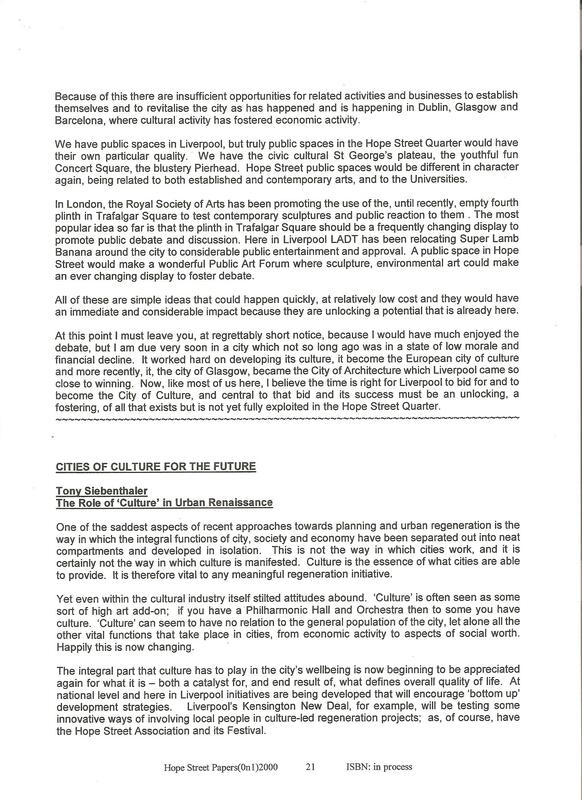 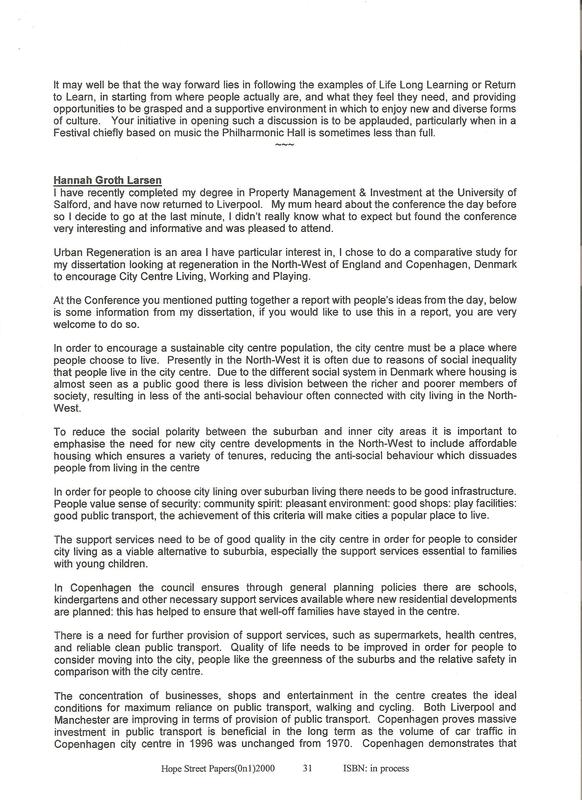 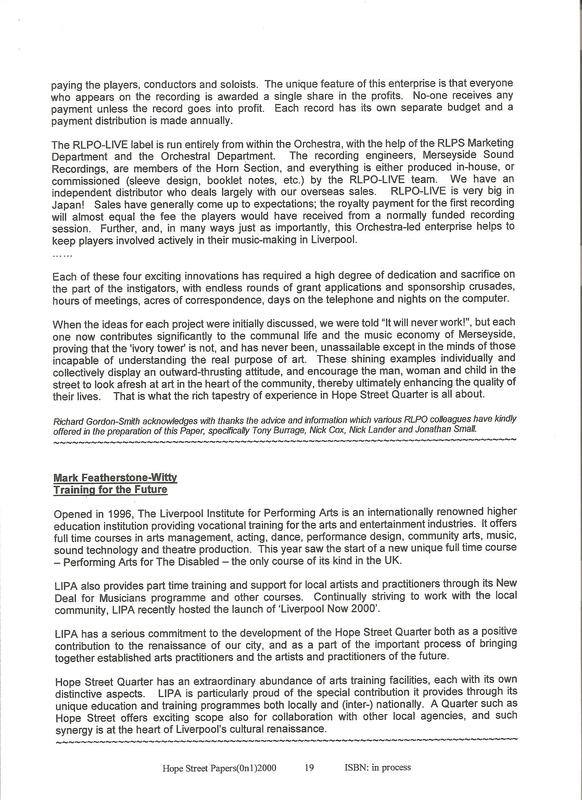 Whilst we were unable, despite serious effort, to find a formal publisher for these Papers – the significance for the Hope Street Quarter of which was probably not then recognised – they were published in a draft ‘handout’ format, and circulated widely. 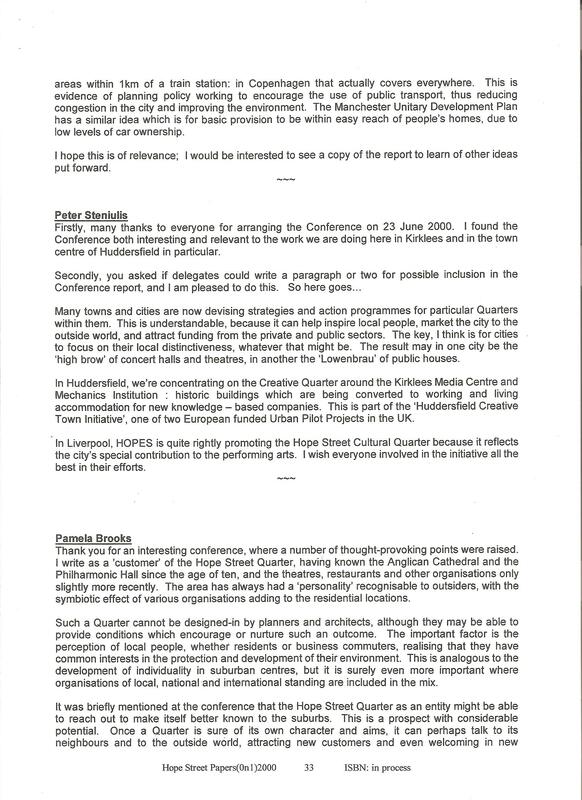 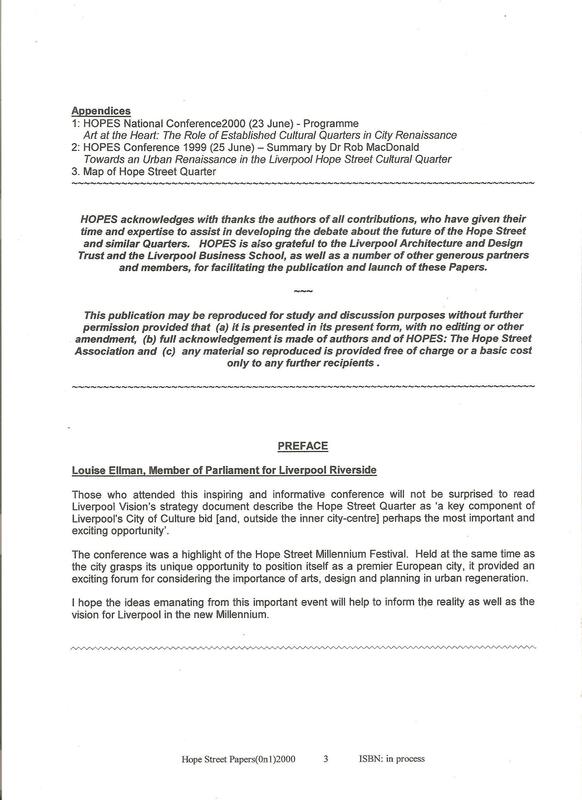 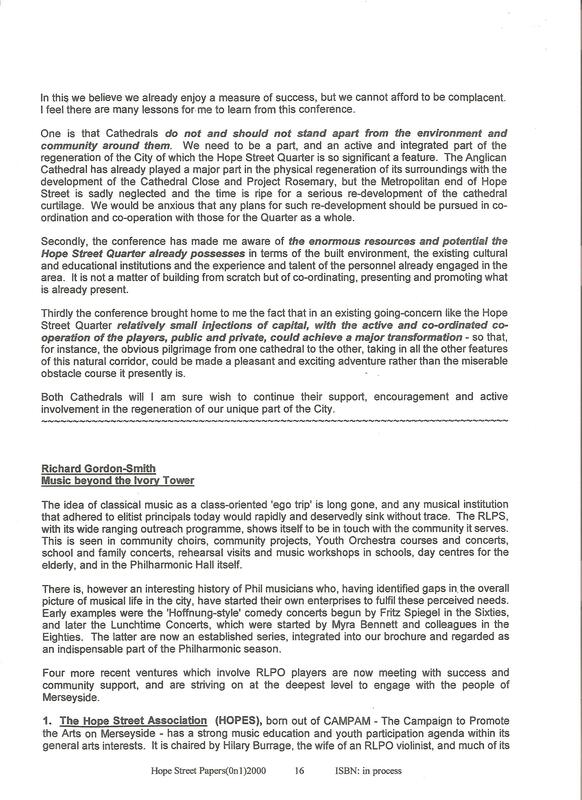 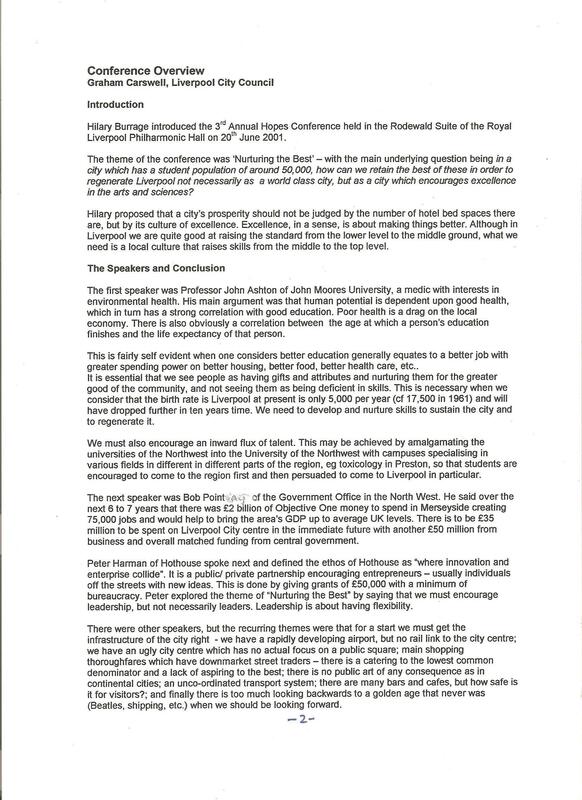 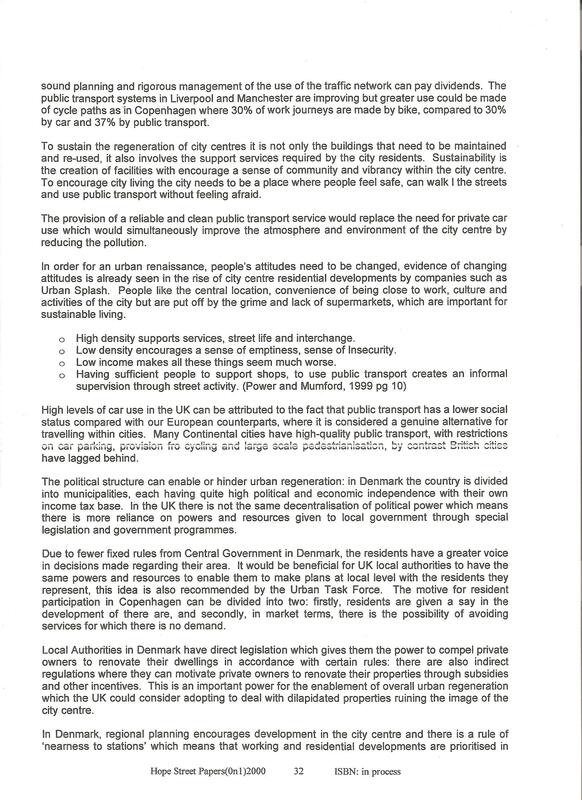 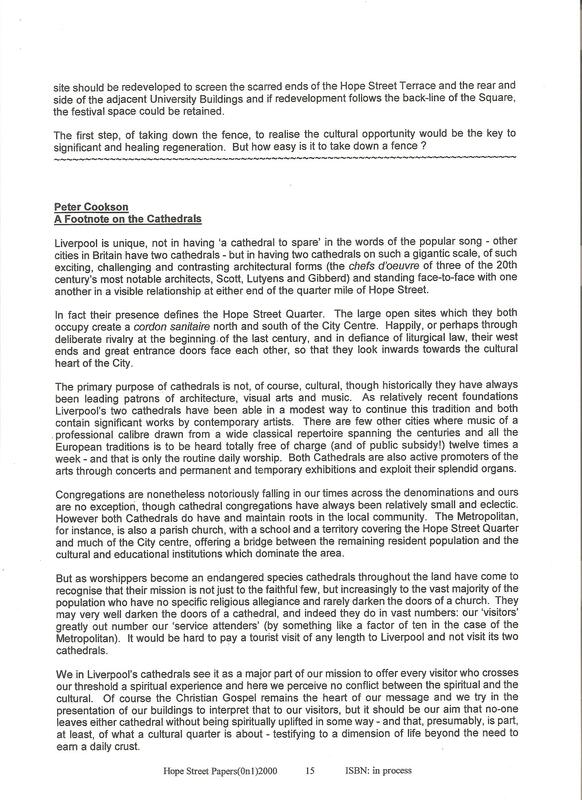 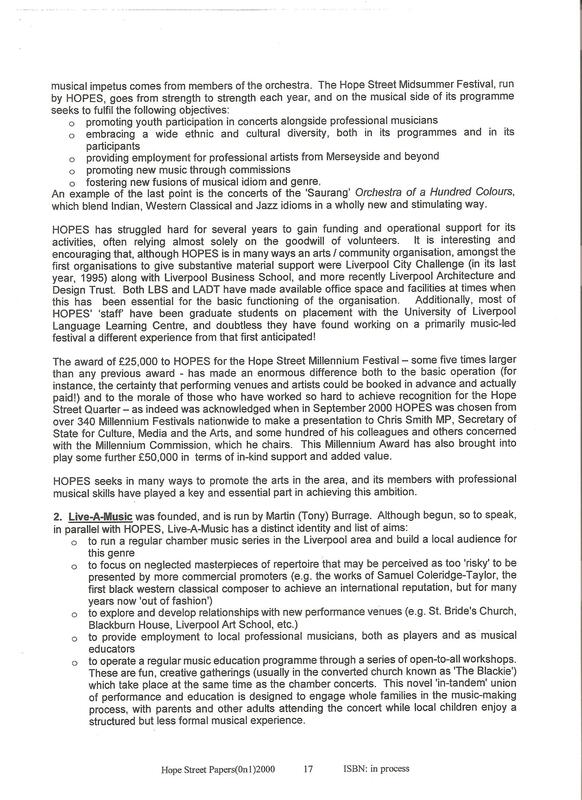 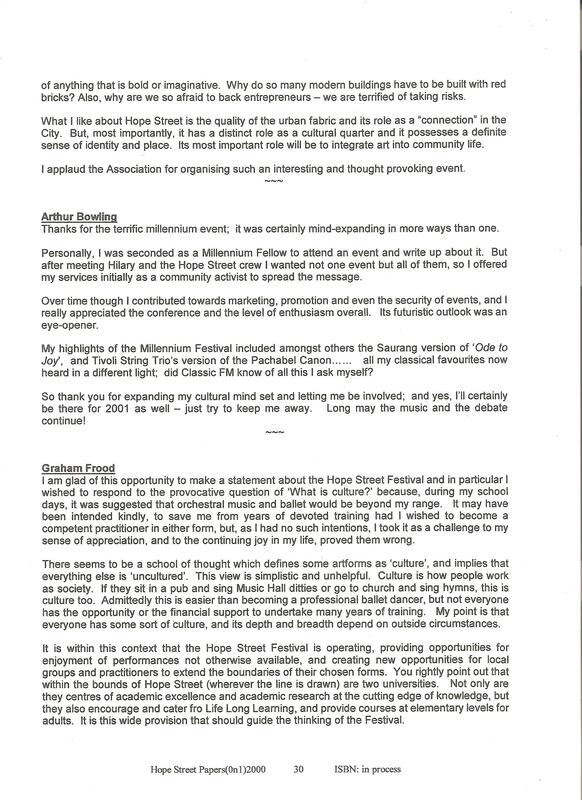 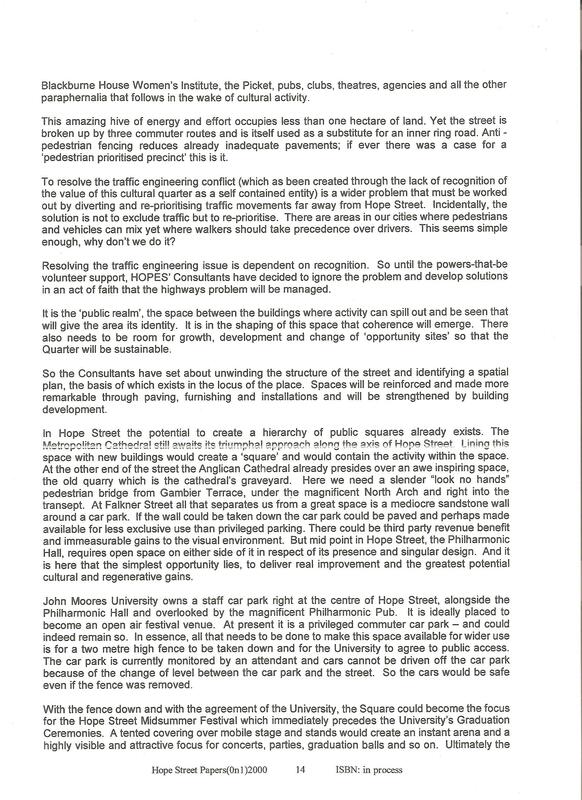 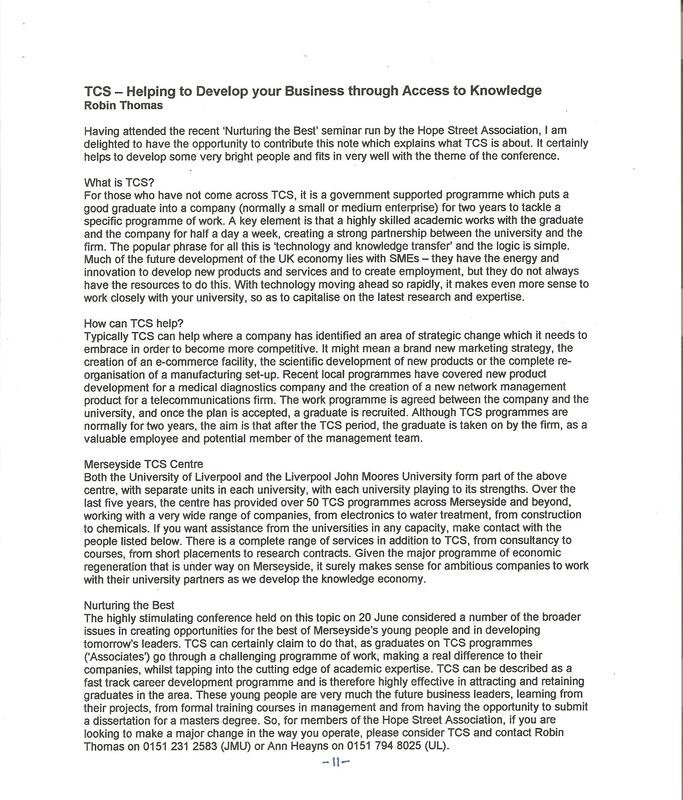 Appendix 2 [below] refers to the proceedings of the Hope Street Conference, 1999. 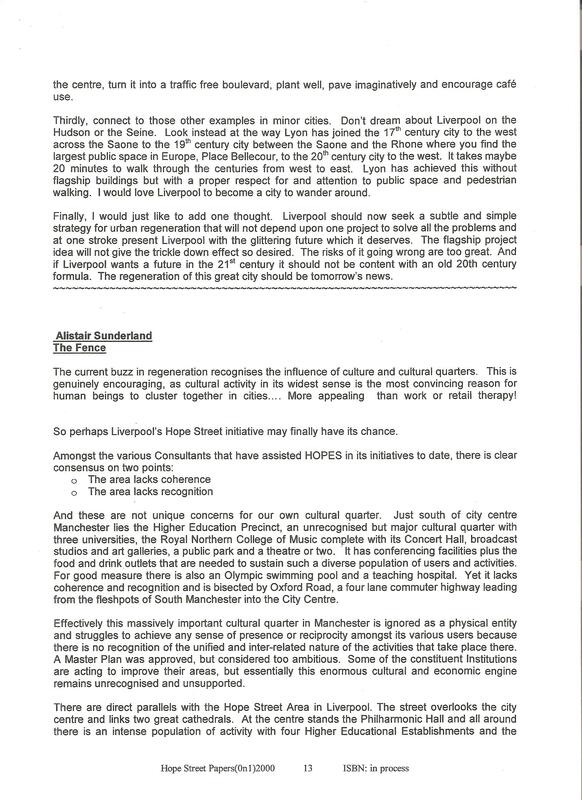 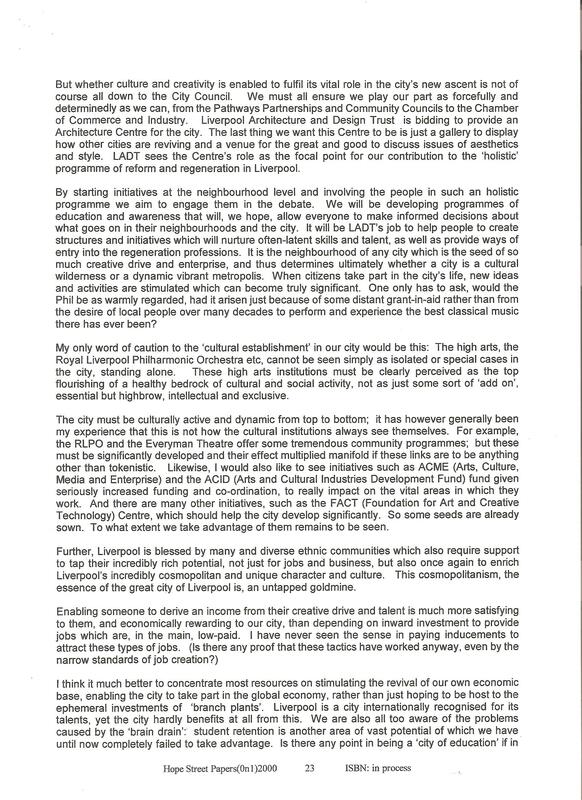 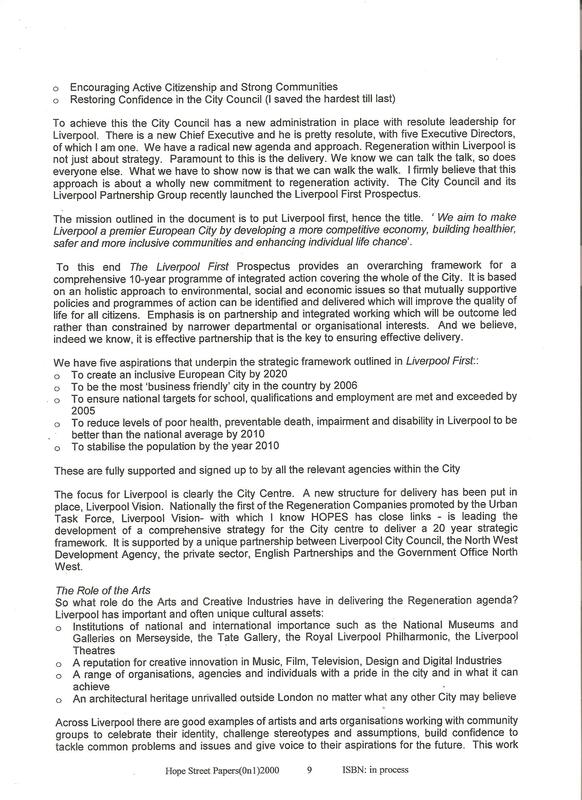 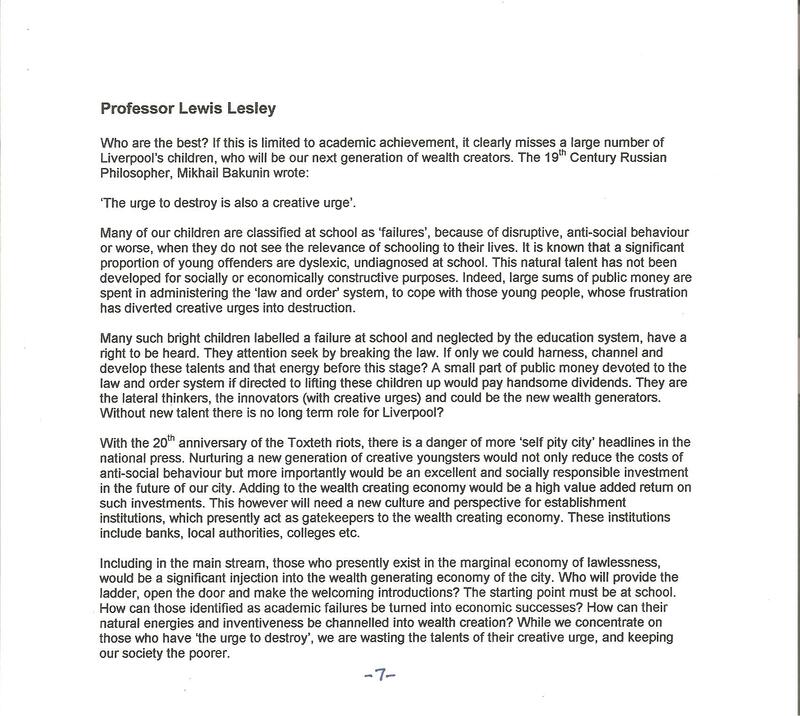 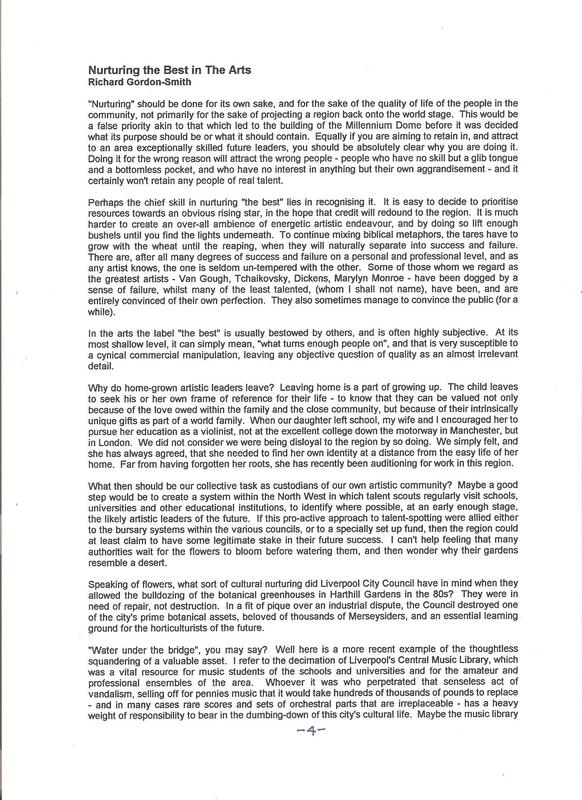 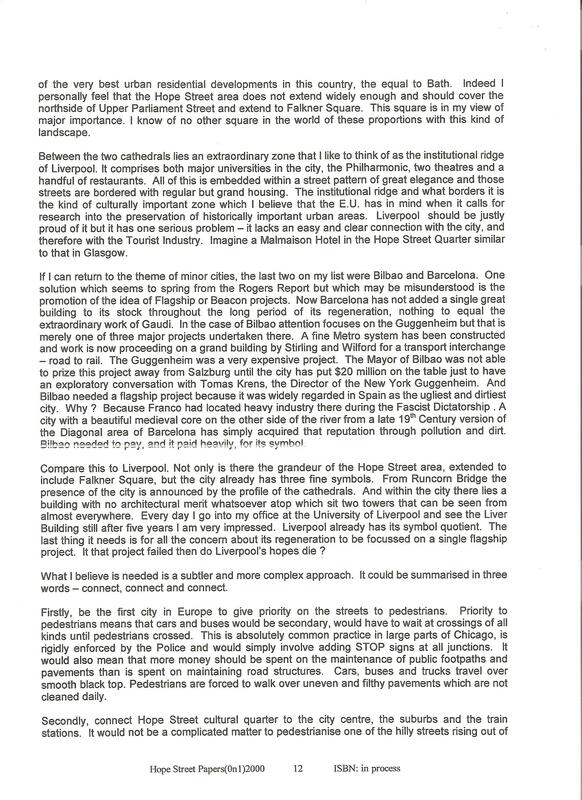 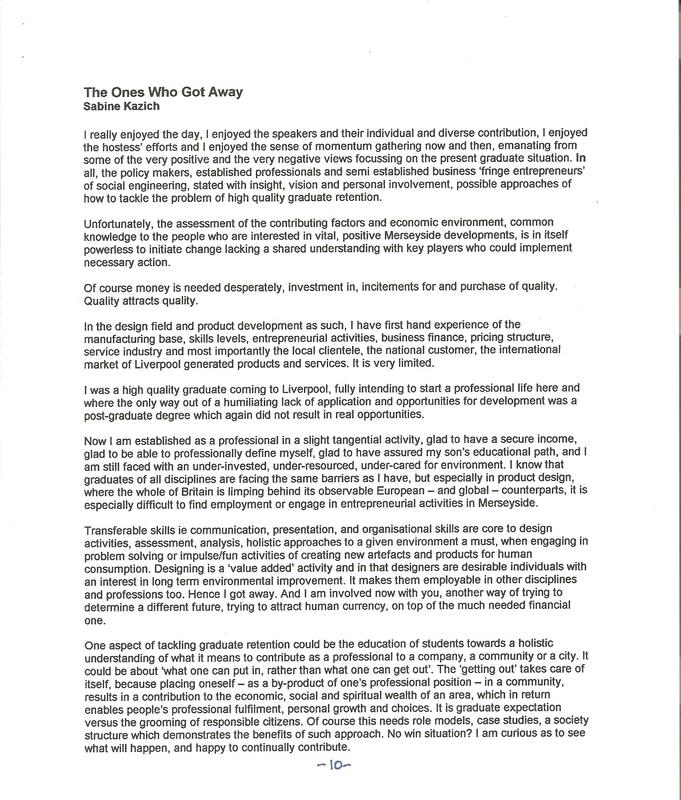 >> Also, here’s a very kind Postscript in 2006 from Joe Riley, who was Arts Editor of the Liverpool Echo for many years…. 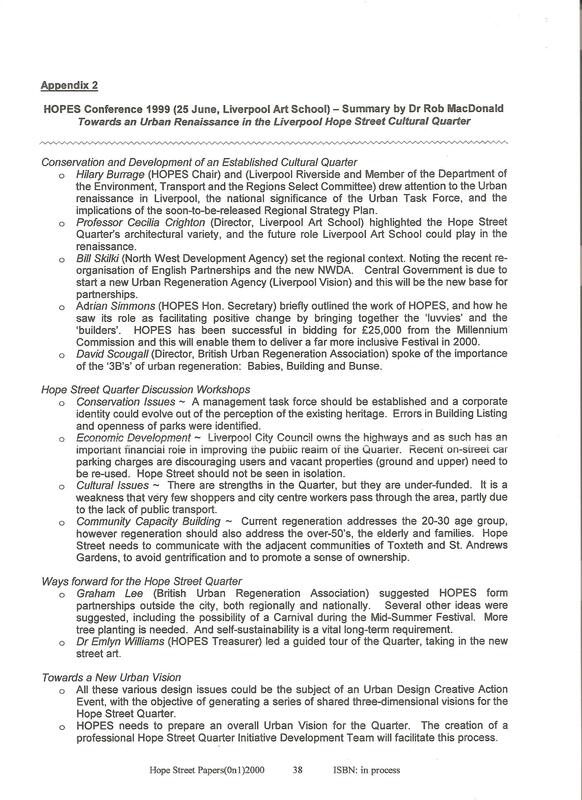 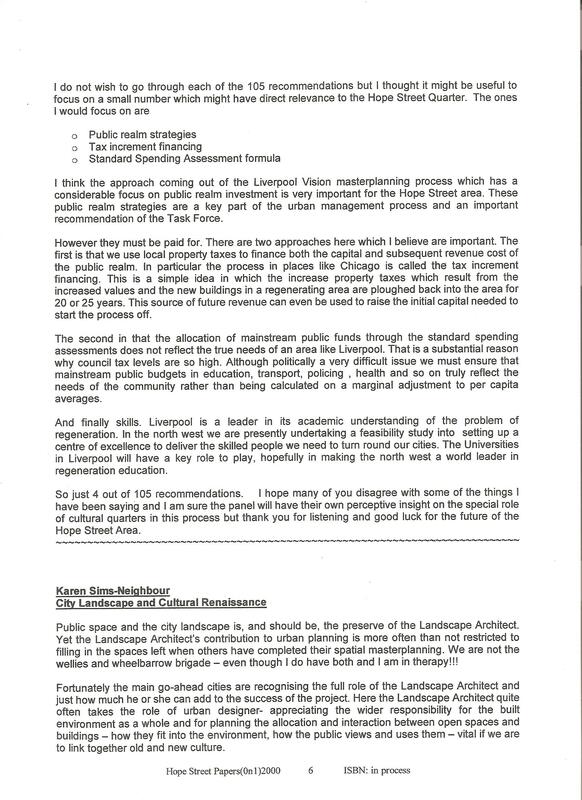 Liverpool Vision’s Jim Gill Reflects On Hope Street Quarter.